This year has been crazy, both in real life and on the blog. I don't know where 17K views came from in August because I don't recall that I actually did anything special in August. 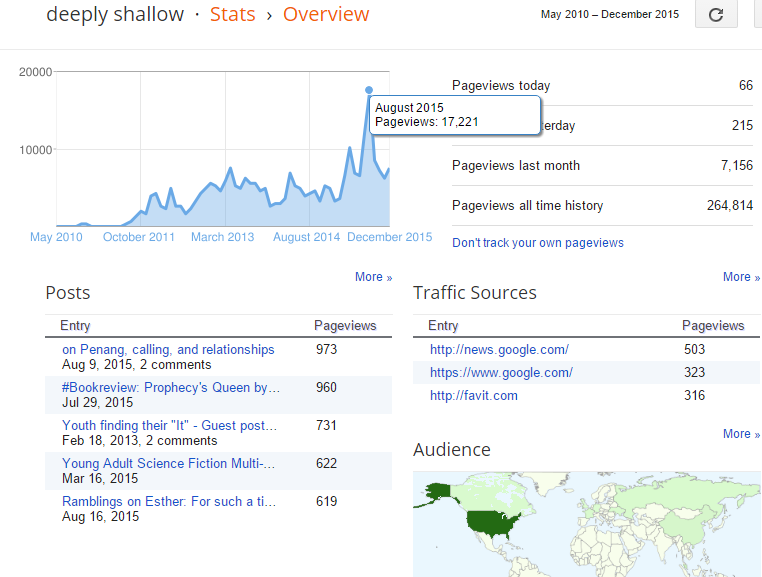 April spikes are always from the A to Z Challenge and sometimes November is NaNoWriMo, except I flunked out of nano this year. Wait. 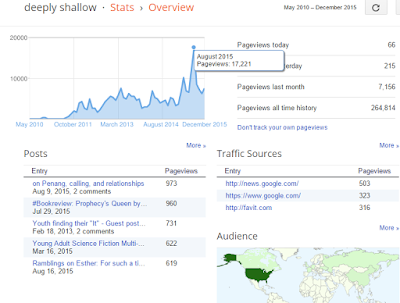 Total pageviews for the year is almost double last year's. What's going on here? (96K vs 53K). Okay, I suppose I was a little more consistent with my Wednesday #bookreview and my Monday #musicmonday posts. Also have been writing longer reviews instead of crappy ones, especially since quite a fair bit of books were read-for-reviews through the author or through Novel Publicity. My #fridayflash posts on Fridays were a little inconsistent this year despite me saying I was going to write, write, write, submit, submit, submit. Side side note: I also received FREE TEA for review this year! From the top posts for the year (wow, 4 new ones! ), rambly posts about internal angst somehow seem to garner a lot of reads: on Penang, calling, and relationships | Ramblings on Esther. I tried to put stuff out to medium earlier in the year, but in the end, readership is always the best/highest on my own blog, so I'm probably just going to cross post there instead of concentrating on it. At any rate, highlights of this year are many and varied. For one, I left my job. I am now an unemployed bum, trying to write the Next Malaysian Novel, which isn't really a great thing, given the state of the local industry. But still, I try. (Hire me!) I'm a little headless-chicken at the moment, because although I have some plans, they're not very concrete at the moment. I have too many strange and scattered thoughts to process at this moment, but I suppose one big thing I should reflect upon this year are the many friendships I have made. Facebook tells me that I have made something like 138 friends during the year (i.e. I added them on Facebook), but that's not really an accurate view of things. What I suppose I should be saying is that I'm grateful for the friends I have made and friendships that have strengthened over the past year, especially the ones who are far away. For some odd reason, I feel like I remember them more often than I do the ones who are close by. People like Monica, Jennifer, Roslyn, Daral, Julia, Iris, Chi. Maybe distance makes the heart grow fonder (if there is such a thing), or maybe my conflicted heart is trying to distance itself from perceived situations it doesn't like, holding on to to happy (happier?) memories instead. Because it doesn't hurt so darned much when you see people far away having fun together without you because you are not physically there compared to when you see reunions happening and people coming home and meeting up without you because you've always been the fifth wheel. But friends. Friends are wonderful things (people?) to have and I am aware that I am still as bad at being a friend as ever. Maybe because I always have nothing to say. Maybe because I do not know how to be generous enough with my time and my money and my heart. Maybe because I am always boring and serious and I don't know how to have fun. Maybe because I don't like doing active stuff, like swimming and biking and hiking and cooking. Writing wise, I finally sold a short story this year, Codes, which appears in Cyberpunk: Malaysia, and I'm too laxy to get a link for you, so just google it. I also published another short story on my own, the link for which appears on the sidebar on the right, but this post shouldn't get all markety. I mean, yes, I did accomplish these things! One good thing about this writing fellowship I am applying for is the fact that they need you to prepare a resume, including your recent publications. And in compiling my resume, I am astounded at how much I have actually accomplished. I mean, it's not very prolific by the standards of some, but... I'm like I did that? I produced something every year since 2011? And this isn't even counting the odd novels I wrote for nano that I have yet to edit and the blog stuff I have been doing. And I need that peptalk, really, because I 'm always harder on myself than I need to be. And if I'm honestly reviewing this year, it has been pretty okay. There were some great times and mostly good times. But the problem is that my mind reminds me instead of all the things that I hate about myself, it focuses on all the times I failed, and all the things I've been doing wrong, and all the opportunities that I've missed because fundamentally, I don't like myself very much. And the reason I don't like myself very much is because I see that other people don't like me very much. And I don't know what standard I'm using to judge that, but it just is. There isn't much left to review of last year, I suppose. It has been an interesting year and all we can do about it now is to forge on ahead.